Don’t you just love blog hops? All the creativity oozing from pages grouped together for your enjoyment? All that blog candy waiting to be won? Well, this Blog Hop is no exception. We have ten very talented ladies sharing their creations for the Cricut Message Board Dress Form Tag Swap from this month. You may have arrived here from Jenn’s Blog, Scrapping Under the Influence. Don’t you just love that name? I would love it even better if I had thought of it for myself..haha! S.U.I…LOVE it! I had so much fun creating my tags for this swap, but not near as much as I did “hanging out” with all of the participants. My first tag is from the Halloween Category. 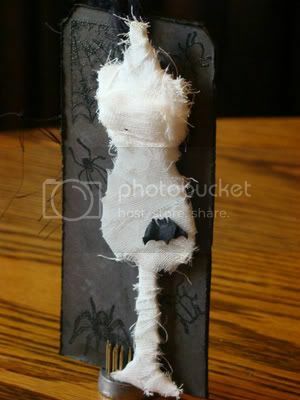 The Mummy is wrapped in cheesecloth and I cut a little bat from some trim that I purchased at my local scrap store. This second tag is for the Designer’s Choice category and sports an adorable apron cut from the Paper Dolls for Everyday Cricut Cartridge. 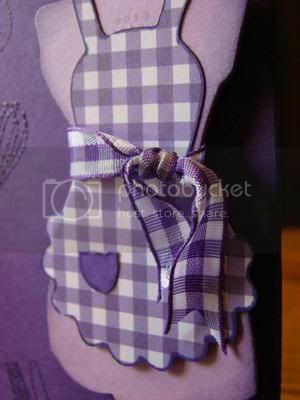 Purple is the color of the day with the ribbon matching the gingham paper used for the apron. 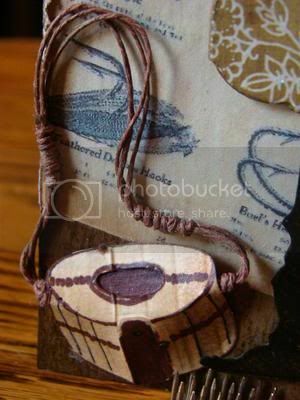 My favorite of the three tags and the one that I spent the most time researching, inking, distressing, embossing, and decopauging is another Designer’s Choice member. Vintage Fly-Fishing is alive and well on this tag. The vest and hat both came from the Paper Dolls for Everyday Cartridge. 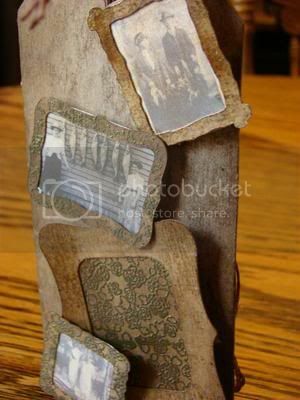 I found the vintage magazine graphic online and decoupaged it to the tag prior to adding the Tim Holtz Sewing Room Dress Form. The back of this tag includes frames cut from the Mothers Day 2010 Cartridge. Each of the vintage photos of women and their catch for the day were found online. 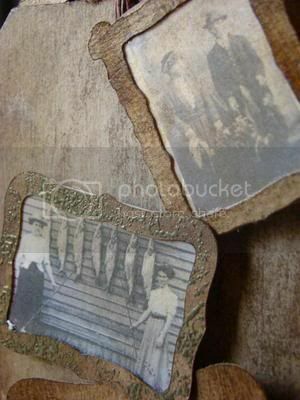 Each was printed and then inked with Tim Holtz Vintage Photo Distress Ink to give them an aged look. 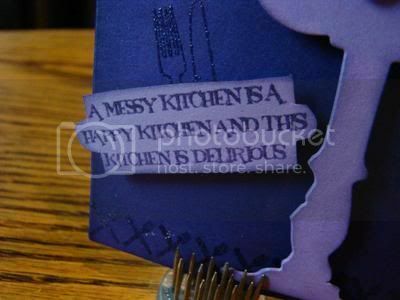 I am so lucky to have a Guest Designer join me on my blog for this blog hop. 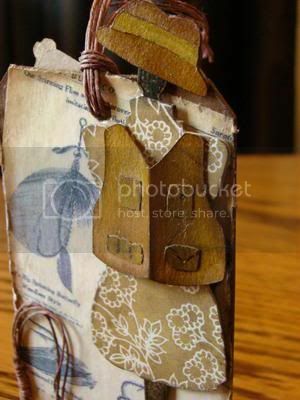 You will see Cindy32 further down in our blog hop line-up, which will bring you back to Simply My Crafts for another look at all that she has created. This is my first time to swap with Cindy. I am so very happy she joined us and I am looking forward to CMB swapping with her again. So, what’s a Blog Hop without Blog Candy? 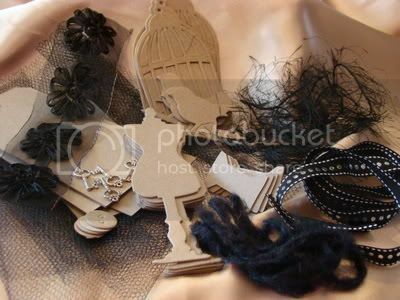 Of course, we have candy…a set of die cuts from the Tim Holtz Sewing Room Set, the Sizzix Movers and Shakers Tag/Boolplate Die by Tim Holtz, and the Tim Holtz Birdcage Die with a bit of other goodies thrown in for good measure. First let me tell you what you have to do for a chance at winning. You will receive chances for each of the following steps. First and foremost, leave a comment here for your first chance. Gain other chances by completing the next steps and coming back to leave another comment telling me which of the other steps you completed. 3. Like my Simply My Crafts Page on Facebook. 4. Become a subscriber on my YouTube Channel. 6. Comment again to tell me which of the above steps you have completed. So that is seven…count them…up to SEVEN chances you have for winning! 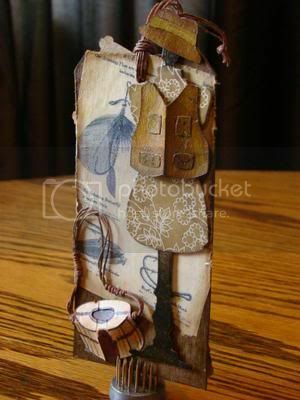 So after commenting here, you must RUN…not walk…to your next stop along the way to Lil Red’s CraftinHood, where you will find the most amazing dress form tag. Thanks for stopping by and I hope you enjoy your journey through the remainder of our Dress to the Nines Blog Hop. I love the tags. The mummy one is amazing!! Thanks for host tag swap. I really enjoyed being apart of it. Jana, LOVE all your tags.. well, all your creations in general! I am so happy that you decided to host this swap and to do this blog hop! WOW….love all your dress form tags, you did an awesome job on all 3. If I had to pick just one it would be really hard to do because they are all so unique and complete. The hallowe’en one is so cool and fun. 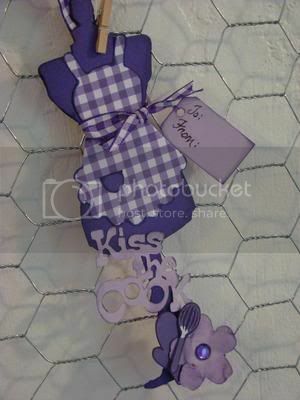 The purple dress is pretty and love the saying and the fishing one is totally awesome. TFS I’m not sure what google friend/follow this blog means? Not sure what is going on with the margins on my comment page, but I am not going to try to fix them during the hop. THAT might be a disaster! Cindy there is pink box over in the right sidebar..that has small picturs of the people that are currently following the blog. I am not sure why it doesn’t say friend connect, but that is where you can add my blog to your list. Thanks very much for stopping by and taking the time to leave a comment! Thanks for hosting another great swap. hmmmmm, so unfortunately I can’t finish blog hopping because I am stuck at number 7 and 8. I don’t have any of the choices allowed to leave a comment, when I select Google Account it is making me get a blog,I don’t want to be made to get a blog with them and it won’t post my comment without it? I really NEED to get a blog set up cause this is so depressing, I just spent half my morning visiting all these blogs, if I had one it would be easier to comment, I think? Or maybe not, if my URL option isn’t available, I just like my name and email address, so simple, why can’t all blogs be like that. I know it’s no one’s fault, it’s the way the blog thingy is set up. But it’s not fair to those that want to participate. This happens so often and I can’t finish blog hops. I am not concerned about winning any blog candy, but would love to leave comments on these amazing ladies creations. They are wonderful and fun and amazing like everyone else’s but I can’t even let them know that. Sry but it was fun. Jana-Thanks so much for all your hard work hosting this swap! It has been so much fun and it’s been great getting to know you! Cindy, I definitely understand your frustration. My blog is a self-hosted WordPress blog (which means I pay for it, among other wondeful things)and I get frustrated myself when some blogs do not allow a name/url comment option. When I take the time to comment on someone’s blog I would like for the links to point back to my own blog…not some google blogger landing page. Anyhow, I will see what I can do on the ones where you cannot comment. I know that I was not able last night and it seemed to be a blogspot problem…yet again! lolol That happened during our last blog hop too. to request our participants to allow name/url type comments. I also am now subscribed to your YouTube channel… I just opened an acct there myself, but have yet to post (or record) a video!! Love the mummy dressform! Great job on everything! These are great! The Mummy is one of my favorites and the fishing one is amazing. You put so much detail into it. Great job! I love all of your Tags!!! I hope that I am in the group with your fishing one!!!!! My DH loves fishing!!!! I hope I didn not post my first comment twice. I just liked you on FB and heading over to Utube. I am now a UTube subscriber. Heading to the next stop! wow! I saw the dress die cut for the first time yesterday and fell in love but decided to hold off on buying it..I think I made a BIG mistake!!! am now a blog following fool!!!! I like you on facebook! I LOVE LOVE the little pearls on the dressform!! Just commenting again that I did steps 1, 5 and 7. I commented here, commented on all the blogs (with difficulty) and came back here to let you know I did the above. A wonderful blog hop girls! Great projects…. love all the detail! TFS! Really wonderful creativity ! I had not idea that so much could be done with these dress forms ! I am so inspired… now if I could only get comfortable with this Blog HOp thing..it confuses me :>( I never seem to get them done right. Wonderful tags, esp. the fly-fishing! You are my first stop on the Blog Hop! I know I am in a for a treat! Hi Jana… Ok, I commented here earlier, I commented on all the blogs (which means now I must go out and buy this die so I can join your future swaps! ), I am a follower here and on facebook too. This hop was phenomenal – GREAT JOB organizing the swap – what a talented group of ladies! all of your tags are adorable and so celverly detailed.